The 2002 Aaron's 312 at Talladega was a NASCAR Busch Series stock car race held on April 20, 2002 at Talladega Superspeedway in Talladega, Alabama. Johnny Sauter of Richard Childress Racing won the pole position, while Jason Keller of ppc Racing won the race. Because of a perceived aerodynamic advantage, several Chevrolet teams opted to run Pontiacs for the race. Johnny Sauter qualified on pole position. Rich Markle was the only driver to not qualify. Sauter led the first eleven laps of the race, losing the lead on lap 12 to Stacy Compton. On lap 14, the largest crash in modern NASCAR history (1972–present) took place at the exit of turn two, with 31 cars being involved. Three cars (Stacy Compton, Jason Keller and Kenny Wallace) had cleared pole-sitter Johnny Sauter as the field started down the back-straightaway. Scott Riggs (fourth on the outside) tried to pass Wallace on the outside, but checked up, causing Shane Hmiel to get in the back of him. Subsequently, Kevin Grubb bumped Hmiel, causing both Riggs and Hmiel to turn sideways down the track and hit the right-rear of Sauter and the right-front of Joe Nemechek, respectively. The impact from Riggs' car caused Sauter's car to turn sideways and flip twice in the middle of the track, thus blocking the track and causing a massive pile-up behind. The drivers involved were Riggs, Hmiel, Grubb, Sauter, Nemechek, Todd Bodine, Larry Foyt, Jack Sprague, Jeff Purvis, Jimmy Kitchens, Randy Lajoie, Kerry Earnhardt, Tony Raines, Bobby Hamilton, Jr., Ashton Lewis, Mike McLaughlin, Lyndon Amick, Greg Biffle, Jamie McMurray, Scott Wimmer, Ron Hornaday, Jr., Shane Hall, Tim Sauter, Jay Sauter, Michael Waltrip, Joe Ruttman, Jimmy Spencer, Mike Wallace, Mike Harmon, Jeff Fuller and Coy Gibbs. At the time of the crash, 41 of the 43 cars were on the track. Of those, only Compton, Keller and Wallace (who were in front of the crash), and C. W. Smith, Hank Parker, Jr., Casey Mears, Andy Kirby, Tim Fedewa, Larry Gunselman and Chad Chaffin (all of whom either got slowed down in time to miss the crash or had lost the lead draft altogether and were elsewhere on the track) made it through without damage. This crash brought out a 40-minute red flag and caused one minor injury to Mike Harmon (required stitches for biting through his tongue). After the 40-minute delay to clean up, the race resumed on lap 20 with only seven cars on the lead lap. The remainder of the race featured two additional caution periods for debris: one from laps 76–80, and another from laps 93–95. Kenny Wallace led from laps 16 to 23, with Compton taking the lead on lap 24; Compton would lead until lap 40, when Keller held the lead for a lap. On lap 42, Compton regained first, leading for 25 laps, surrendering the lead to Jeff Purvis on lap 67. The next lap, Keller retook first, leading for the remainder of the race. Only three cars – Keller, Compton, and Tim Fedewa – finished on the lead lap. Kenny Wallace (engine), C.W. Smith (overheating), Purvis (engine), Lewis (crash), Biffle (engine), McMurray, Wimmer, Hornaday, Johnny Sauter, Hall, Tim Sauter, Nemechek, Waltrip, Ruttman, Spencer, Mike Wallace, Harmon, Fuller, Gibbs (crash), Brad Teague (overheating) and Christian Elder (engine) failed to finish. The race featured a total of six leaders and seven lead changes. The win was Keller's first career victory at a superspeedway, his seventh-career Busch win, and his second of the season. ppc Racing owners Greg Pollex and Keith Barnwell recorded their 26th and third wins, respectively. 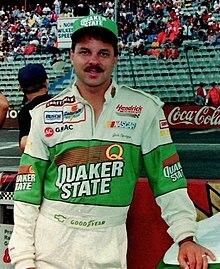 Jack Sprague (pictured in 1996) remained the points leader after the race. ^ Rodman, Dave (April 18, 2002). "Pontiacs proliferate at Talladega". NASCAR.com. Turner Sports Interactive, Inc. Archived from the original on December 6, 2004. ^ Rodman, Dave (April 19, 2002). "Talladega all about making smart decisions". NASCAR.com. Turner Sports Interactive, Inc. Archived from the original on December 6, 2004. ^ Rodman, Dave (April 18, 2002). "Sauter wins Bud Pole for Aaron's 312". NASCAR.com. Turner Sports Interactive, Inc. Archived from the original on December 6, 2004. ^ a b c d e "2002 Aaron's 312 at Talladega". Racing-Reference. Retrieved June 18, 2015. ^ "Race Lineup: Aaron's 312". NASCAR.com. Turner Sports Interactive, Inc. Archived from the original on December 7, 2002. ^ Rodman, Dave (April 20, 2002). "'Big one' collects nearly 30". NASCAR.com. Turner Sports Interactive, Inc. Archived from the original on April 4, 2005. ^ 2002 Aaron's 312 30 Car Wreck at Talladega. NASCAR. YouTube. January 31, 2012. Retrieved July 26, 2013. ^ "Keller holds off Compton to win Talladega Busch race". Savannah Now. April 22, 2002. Retrieved June 18, 2015. ^ Smith, Marty (April 22, 2002). "Keller edges Compton in crash-filled Aaron's 312". NASCAR.com. Turner Sports Interactive, Inc. Archived from the original on December 6, 2004. ^ "BUSCH: Talladega: Jason Keller race report". Motorsport.com. Motorsport Network. April 22, 2002. Retrieved October 1, 2017.